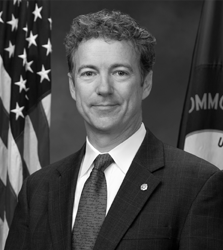 Rand Paul is a first-term senator from Kentucky who describes himself as “libertarian-ish.” He is also the son of former Texas Congressman Ron Paul, who ran for president on the Libertarian Party platform in 1988 and ran for the GOP nomination in 2008 and 2012. The younger Paul announced his campaign for the 2016 Republican nomination in April 2015. Key issues he has focused on since his election include deregulation, reform of the criminal justice system, and opposition to much of the Patriot Act and what he views as unwarranted surveillance of Americans without proper court approval. While espousing a less interventionist foreign policy than many Republicans, he is more hawkish than his father. While Paul shares many of his father’s views, he has been solidly conservative on most issues. This has posed some problems for his campaign, as many libertarian-oriented Republican voters have been disappointed in his seemingly “middle of the road’ views, for example criticizing drug prohibition but not coming out in favor of full repeal of the “war on drugs.” At the same time that he disappointed some libertarians who backed his father, his libertarian views on foreign policy issues have left many more hawkish conservatives leery of his candidacy. Paul has considerable political talent, and has shown greater ability than his father to effectively communicate libertarian views. But his fundraising has generally lagged those of his rivals, and his poll numbers declined to the point that after qualifying for the first several “prime time” Republican debates he failed to qualify for the main stage at the mid-January debate. His poll numbers have risen modestly in recent weeks in Iowa, however, and he qualified for the next debate. While some thought there might be an opportunity for Paul to add more conventionally conservative voters to his father’s libertarian base, thus far there is little indication that this has happened. Paul has remained a second-tier candidate occasionally in danger of falling to the third tier, and it’s unlikely he can surpass or even match his father’s previous success in the GOP nomination process. His first foray into political office was his 2010 run for the U.S. Senate which he won after first defeating in a primary the establishment pick for the Republican nomination.4 However, prior to his run for office he joined his father on the presidential campaign trail and founded Kentucky Taxpayers United in 1994.5 That group disbanded in 2000. His current committee assignments (in the 113th Congress) are: Foreign Relations, Health, Education, Labor and Pensions (HELP), Homeland Security and Government Affairs, and Small Business and Entrepreneurship. There is little doubt that Paul’s principles are firmly grounded in libertarian thought, although like his father he is fairly conservative on social issues. There is very little difference in the statements he has made on the campaign trail and the policies he has supported since being elected. He has not hesitated to take unpopular stands at odds with party leadership or key conservative constituencies, perhaps most notably regarding the use of drones in the war on terror. In 2013 and 2014, Time magazine named Paul one of the 100 most influential people. He has also received other awards and recognitions, including the Melvin Jones Fellow Award for Dedicated Humanitarian Services from the Lions Club International Foundation (for founding the Southern Kentucky Lions Eye Clinic). As one of Time magazine’s “most influential people,” Paul has developed a national name for himself. His positions opposing most U.S. intervention in overseas conflicts has also earned him a following by independents and some on the left, including liberal television show host Bill Maher. Paul’s fellow Kentucky senator, Mitch McConnell, has publicly endorsed Paul for president. Sen. John McCain also expressed his growing support for Paul in a September 2014 interview. Paul, along with now former Sen. Jim DeMint and Sen. Mike Lee created the Senate Tea Party Caucus in the Senate. Paul’s voting and bill sponsorship records show his support of policy important to those on both sides of the aisle, and he has demonstrated an ability to work with people who have a broad range of political views. His willingness to tackle issues such as elimination of minimum mandatory sentencing and what he calls the “militarization” of police has given him credibility in speaking to minority communities that many Republicans lack. Paul is a strong communicator, especially when he is talking about government “spying” on private citizens’ lives. The topic and the passion with which he speaks often excites not only many in the Republican base but also under-30 voters.19 He has spoken to a broad range of groups that transcend the traditional conservative bases around the country. In addition to his appearance at the Conservative Political Action Conference (CPAC),20 he has also spoken to audiences at Howard University (a historically black college) and University of California-Berkeley. This broad public speaking portfolio has provided him the ability to practice and refine both his speech content and delivery. Upon entering the Republican primary in 2010, Paul raised a record-breaking $433,509 in a 24-hour period. As a political newcomer, he faced a tough primary against Kentucky Secretary of State Trey Grayson. Grayson attacked Paul early and accused him of having “strange ideas” and suggesting that American policy was the cause for the September 11 attacks.21 In the general election against Kentucky Attorney General Jack Conway, Paul’s campaign outspent his opponent: $6 million by Paul, $4.7 million by Conway.22. Paul’s former chief of staff, Doug Stafford, resigned his position within the Senate office to begin overseeing Paul’s national political operation.23 Stafford is also assigned to run Paul’s political action committees – RAND PAC and Rand Paul for U.S. Senate24 – which are likely to be the financial and political foundation of Paul’s run for president in 2016. Stafford previously worked for National Right to Work. Paul co-sponsored the National Right to Work Act38 – a bill that would amend the National Labor Relations Act to disallow the firing of an employee for his or her refusal to pay union dues. Numerous states have passed right-to-work laws for their respective states, but the National Act would make this rule applicable across all 50 states. Paul’s actions have also been very small-business friendly – namely his ongoing support for efforts to reform the regulatory rule-making process at the federal level. He is the author and lead sponsor of the REINS Act, which would: allow a grace period for regulatory violations (late filings, etc. ),39 require Congressional approval of any major regulatory rule,40 and require a cost/benefit analysis for every proposed regulatory rule by federal agencies.41 He opposes “net neutrality,” a policy that would allow the federal government to dictate the terms and conditions Internet service providers must offer their services under. In 2011, Paul co-sponsored a welfare reform bill53 that increased work requirements and supervised job search programs for welfare recipients. The bill also called for annual means testing54 and was aimed at more aggressively and effectively getting people off public assistance and on the path to self-sufficiency. Paul’s record on agriculture policy is largely centered on agricultural subsidies. He has voted in support of limiting subsidies given to individuals or entities that have an average adjusted gross income of $750,000 or more.66 He has also supported focusing benefits and payments to farmers with an income of $250,000 or less and eliminating subsidies altogether for those farmers with an income of over $1 million67 – essentially keeping access to subsidies for smaller farmers and cutting off or reducing the government assistance to large farms. He has said he opposes mandatory labeling of food containing genetically modified organisms, saying he prefers to have the market determine labeling requirements.68 Paul has also voted against sugar subsidies69 and price supports for peanuts, sugar, and milk.70 However, he did vote against the repeal of crop insurance premium subsidies71 for tobacco growers, a key industry in Kentucky). Paul is a member of the Senate Foreign Relations committee and the Homeland Security and Government Affairs committee. Both assignments have provided him background in these two policy areas and can put him at an advantage over some of his potential primary opponents. Paul has said publicly that if he’d had the chance, he would have voted against the U.S. invasion of Iraq.95 He also opposed the U.S. actions in Libya96 and initially opposed the actions against ISIS in Syria – saying that those actions made the area unstable.97 However, in September 2014, Paul reversed his position on U.S. intervention in Syria and expressed his support for the strikes against ISIS.98 He recently said he opposes establishing a no-fly zone in Syria, which he said could lead to “World War III” with Russia,99 but he favors providing arms directly to the Kurds to fight against ISIS.100 He has said the U.S. should not accept Syrian refugees because of concerns terrorists might use the program to come to the U.S., and he also suggested French citizens wishing to travel to the U.S. might need to face enhanced scrutiny.101 He has also said the U.S. should not sell any more weapons to countries like Saudi Arabia and Qatar until they begin accepting Syrian refugees. Since 2010, there have been some questions regarding his board certification in the state of Kentucky. Dr. Paul was certified under an organization called “National Ophthalmology Board,” an entity he founded. However, the organization has been out of business since 2011 and was never recognized by the American Board of Medical Specialties. He had previously been certified by the American Board of Ophthalmology. Dr. Paul has faced two malpractice lawsuits in the course of his career – one that was dismissed, and another that resulted in a $50,000 settlement with the plaintiff. He is listed as the president of a company called Alchemy LLC. The company is based in Bowling Green, Ky., and lists his wife and his father as members. It seems to be the main source of income for the senator. Paul’s Senate campaign lists Alchemy’s address as its headquarters, although the campaign has not paid rent or reported an in-kind contribution from Alchemy for the use of the address or space. Interestingly enough, despite his father’s position as a member of the Alchemy LLC company, the senior Paul (Ron) has not listed the company on any of his own financial disclosures over the past five years. It is uncertain what the company does or how it generates income for Rand Paul. Paul’s religious activities have been a factor in his political career, including in 2010 when his opponent for the Senate seat called Paul’s Christianity into question due to some affiliations Paul had in his college years. Paul’s opponent accused him of being a member of the NoZe Brotherhood during his time at Baylor University. This group, known for its humor, would publish satirical articles targeting the university and the Southern Baptist convention. His opponent also accused Paul of tying up a woman in college and forcing her to bow down to a god called the “Aqua Buddha.” These allegations appeared in GQ, The Washington Post and Politico, yet a source was never printed.